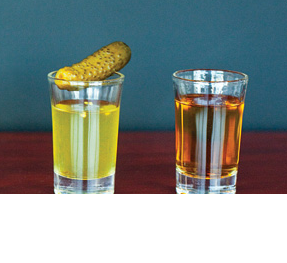 A pickle back is a shot of dill pickle brine that you use as a chaser. It has nothing to do with that pickle-loving Nickelback cover band. Generally you gulp down the pickle back after you take a shot of liquor. Apparently it goes really well with Jameson, and it definitely does not mix with Fireball. My sister is a big fan and advocate for pickle backs. She insists that everyone tries it at least once. She always had an unhealthy obsession for pickles though. I wouldn’t recommend it if you don’t like pickles. Go for it if you do. It gives you the ability to conquer the most vile shots imaginable. You’ll be blacked out in no time.